WordPress has a strong worldwide community that is constantly growing and evolving. Whether you are WordPress designer or coder, we believe that if we want to grow stronger and be more successful, we need the support from the community, continue learning and growing along with it. I, personally have been in the open source community for 10 years and I have learned a lot from everyone. It would be a mistake if we cannot connect to the community and grow from it. I was talking to Joe about this matter and we came up with an idea to collect a list of well-known and influential WordPress bloggers. Joe is our new friend and contributor at DesignWall, he is also a WordPress blogger. He did a good job on helping us with the list. You guys can find out more about Joe at his author profile (or via his twitter @joecanwrite). 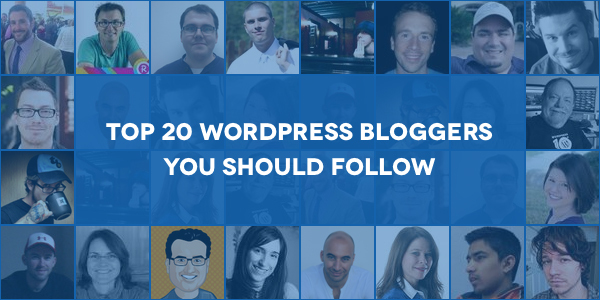 So without further ado, here is our list of the top 20 WordPress bloggers you should follow. Through their blog and their sharing knowledge, I believe we all can learn a lot from them and enhance our WordPress skills in one way or another. John is the project lead for BuddyPress and bbPress, as well as one of the contributors to WordPress. If you are using BuddyPress or bbPress, then you should not miss out John. Chris Lema is definitely a well-know name in WordPress community. On a daily basic, Chris shares his insights and knowledge via his blog posts which I find very informative and helpful. In addition to this constant stream of excellent content, Chris is a regular speaker at WordCamp events and has a number of eBooks and courses available. For business owners and entrepreneurs, Chris and his blog are a wealth of useful information. If you are working as a WordPress freelance then Tom Ewer will be your source of inspiration and high quality content related to WordPress, freelancing, and productivity. Tom made the successful transition from freelancer to agency owner and documents his journey at his popular blog Leaving Work Behind. Kevin has many years of experience with WordPress which he shares on a regular basis through his blog and newly opened discussion forum Rise Forums. If you are putting any effort into SEO, whether for your own projects or for client work, then their free WordPress SEO plugin will probably already be familiar to you. The blog output from Joost de Valk and the Yoast team covers everything from conversion rate optimization, through to usability, and social media, keeping you up to date on the latest developments that can help your business grow. Matt is a prolific publisher across multiple platforms, covering everything to do with WordPress. He also runs the Slocum Studio WordPress agency. For those who just start out their WordPress business or anyone who needs a helping hand with their business, Matt has recently launched a mastermind for WordPress startups. As an online marketer and WordPress developer, Joyce has a strong knowledge of SEO. She contributes to some of the biggest WordPress blog out there and shares her knowledge and experience gained from working in the trenches. Adam and the team of blogging wizards regularly post articles that help you improve your content marketing efforts in order to further grow your business. Adam runs a marketing agency and shares what he learns from the job on his blog, ensuring that all the tips shared are tried and tested in the real world. Carrie is a freelance consultant who now works 100% on WordPress development. Carrie’s blog covers everything you need to know, including reviews of tools for freelancers, WordPress development tips, tutorials, and great design advice. Jeff’s blog posts at WP Tavern, the site he founded back in 2009, often break the latest news surrounding WordPress. If you want to keep up to date then definitely you should follow him and the Tavern team of writers. Jean runs the popular WP Mayor site which features the latest news and reviews for WordPress. The site also aggregates the latest WordPress jobs making it an excellent resource for anyone looking to pick up some extra development work. Jean also offers a number of services for WordPress. If you need help on marketing your business then Kristi’s blog is the site you have been looking for. Besides publishing a veritable avalanche of marketing strategies, Kristie is also a successful freelance writer, contributing to a number of high-profile blog pages. Devesh runs a number of successful websites powered by WordPress including the popular resource site WP Kube. If you want to know about the latest plugins and themes for WordPress then his news and reviews will have them covered. With new content going up almost daily, as well as enthusiastic debate in the comments section on most posts, Tom’s blog is one of the go to places on the web for WordPress development information. Pippin is another successful entrepreneur who has carved out a successful living in the WordPress eco-system. Yes, we all know that the famous plugin EasyDigitalDownloads is from him and friends. As well as being a homepage for his plugins, Pippin’s website also features the latest news and reviews of WordPress products. Andrew is deep into WordPress with his contributions taking many forms including organizing WordCamps, developing plugins, and offering development services through this Reaktiv Studios. He recently released the Genesis Design Palette Pro plugin which has proven to be a godsend for Genesis users. Rémi is a fulltime developer working at WooThemes on their eCommerce toolkit WooCommerce for WordPress. Rémi’s blog features lots of great tips for developers with a leaning towards plugin development and eCommerce. Bob Dunn has a WordPress blog which features lots of useful tips and advice for WordPress users of all levels. Bob also offers WordPress training and coaching service so if you need some extra help, he is the man to turn to. Regina heads up the team of security experts at WP Security Lock and regularly contributes to their blog. If you want to ensure your WordPress site is locked down and doesn’t pose a security risk then you will be pleased to know that there is plenty of good information available from this blogger. Mark is a self-proclaimed capitalist and libertarian, but more relevantly he is the lead developer on the WordPress project. He is a great author and his blog gives a real insight into WordPress development as well as covering a wide range of interesting topics. Well that’s it for today! Hopefully there are some new names and faces to you on this list. If there are any inspiring WordPress bloggers you follow, please let us know.